These are photos of the poison ivy leaf. I am amazed at how many people don’t know what poison ivy looks like, and I wish to educate people! I see it everywhere, especially in any lesser maintained areas, even all around Fayette County. I’ve even had it in my own suburban yard growing up the fence and my property is maintained well. I’ve found it crawling all in a client’s garden bed, that’s also maintained well! If you go hiking anywhere, you’re going to see it, and often right by your feet as you’re going along the trail. But do not worry, as long as you know it’s there and you watch where you’re going, you will be okay. Even if you find it in your yard, it’s still going to be okay as long as you know how to deal with it. First, learn to identify it. It’s a vine, and has tree leaves. The two leaves at the base are usually smaller and there’s the middle leaf is usually slightly larger set in-between the two that go out sideways. It also has notches along its leaf margin that look like triangles. The leaves on every vine may not necessarily looks exactly the same. Look at the notch pattern difference between the top two photos. Some of them have a ‘thumb’. But once you begin to identify it out in the landscape, it will likely become easier when you see it other places. 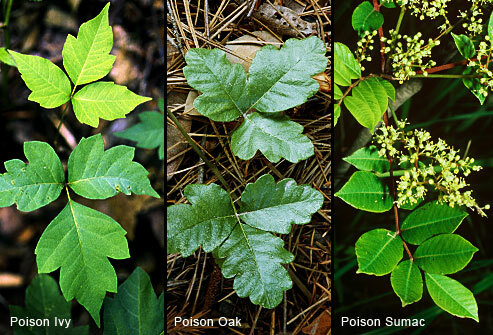 We do not have poison oak in Kentucky. Look at the top three poisonous plants that we commonly hear about in the photo below. Evidently there is poison sumac in Kentucky, but it’s rare. I personally haven’t ever come across it that I’ve known. Even though it’s likely you won’t come across it, it’s good to just be aware. Do not confuse poison sumac with our awesome native sumac varieties, like stag horn sumac or winged sumac which doesn’t look anything like poison sumac and are actually edible to some degree. 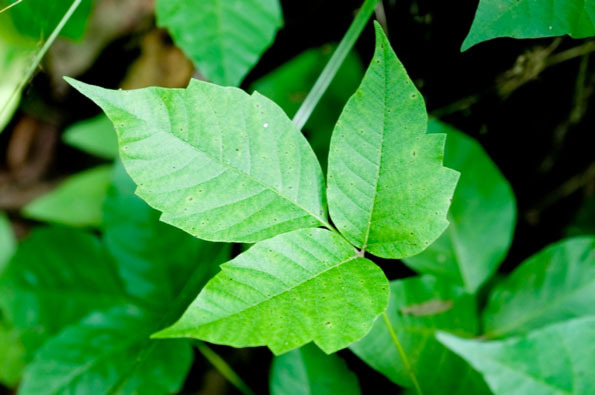 Urushiol is the itchy causing oil that is in poison ivy. The oil can last a very long time on items its touched if it’s not washed off. Meaning if you touch it, you can get it a year later not knowing! The oil can be broken down with good dish detergent like Dawn, Palmolive. However your skin is going to absorb it quickly, so treatment needs to begin quickly. You can also purchase something called Technu. They have several different kinds of products. I’ve used the cleanser and it works. I keep a bottle of it in my garden tool kit to use on my skin, and a bottle of dish detergent on hand to clean tools just in case. It is also supposed to remove skunk odor! It’s safe on skin, clothes, tools, pets, and more. You can also get poison ivy from another person because the oil can spread! Your dog or cat can’t get poison ivy, but it can get on their fur and transfer it to you. Don’t burn poison ivy. Evidently even the smoke is potent enough to create a bad situation in your lungs. Even beware of dead poison ivy vines. There are lots of poison ivy myths; you cannot eat it and become immune to it! No one is immune to poison ivy. All of us have different tolerances to it and you may have a high tolerance. But the more you come into contact with it, the more allergic to it you’ll become, and the more likely you will be to break out. I always try to wear pants while hiking. In some areas, poison ivy seems to be all along the edges of the trail, low to the ground, just hanging out. Even if you think it’s dorky looking, tall socks even while wearing shorts are going to prevent it getting directly on your skin. Pants with tall socks and boots is the best. There’s a reason it’s the hiking fashion! You’re also likely to see poison ivy at the base of trees and climbing up them. I’ve hiked in a lot of areas with a lot of poison ivy, and haven’t ever been effected. You just have to know it’s there and eyes focused on the trail! Poison ivy can start to grow in any area that’s not maintained by mowing or weeding. At my house, it has been found growing along my neighbor’s fence, who has a double paneled fence (meaning there’s two layers of fencing and a 4″ space where weeds love to grow). The weedeater or my hand doesn’t really reach the in-between area. Poison ivy is spread by its berries, and the trailing vine. If left, it can become a bush in certain cases! The neighbors behind my mom have a broken down fence they refuse to take down, even though my mom put up a new fence. This means there is a 6″ space between the fences. The largest poison ivy shrub I’ve ever seen or could imagine has taken over the whole fenced area. It’s a very serious safety issue that I think should be a code violation. Which means it looses its leaves in the winter. When a plant has its leaves, there is energy in them. When it begins to turn cold, the energy moves into the stems and roots of the plant, and the leaves fall. This makes poison ivy more potent in the wintertime (but still avoid any of its fallen leaves). I suggest leaving any vine alone until you know it’s poison ivy or otherwise (like an other great native vine that should be left!). From experience, if you know there’s poison ivy on a tree you’re having removed by a company, it’s an excellent gesture to tell them. It can be extremely dangerous! Even if you’re not sure what it is, but realize it’s a vine, go ahead ahead and point it out. 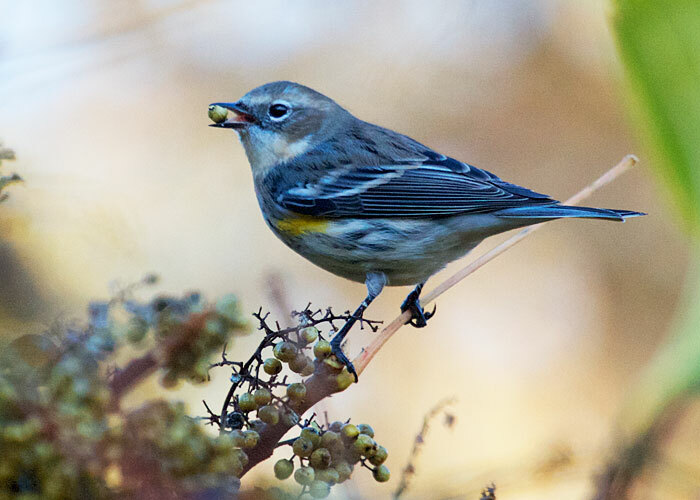 …And Its Berries Are Great For Birds! Even though poison ivy is poisonous to us, it’s actually great for birds. It is a native plant to Kentucky! Its berries has one of the largest fat contents of any berry we have. This means it’s great for birds in the wintertime to gain weight and have energy during the cold months. So poison ivy isn’t so bad in this way! We need it to be left in our wild areas as long as it’s not in highly trafficked areas by humans. The way I have eradicated it in gardens I’ve worked in has seemed to work. However, most of these vines were not massive specimens. First, I have a designated pair of cheap pruners that I use only for poison ivy. This helps me contain everything better. I then make sure I’m wearing a button down long sleeve shirt I can take off and I wouldn’t care to throw away if the vine really got on me. I then wear a pair of cheap cotton washable gardening gloves with a large pair of plastic gloves over top of them. I plan ahead and make sure I won’t have to touch anything else after I start working. I have the hose, dish soap, and technu ready to go for cleaning. I also have a lawn or plastic bag ready and open to put the poison ivy into for disposal. I then start to clip away piece by piece of the ivy in small amounts. This helps keep the ivy from swinging everywhere and makes it easier to place in the bag. I clip the vine away until I’ve left a small amount of the stem coming out of the ground. I then remove the plastic gloves with the garden gloves still on and spray the open cut of the vine with an herbicide. If it’s a small enough plant, I sometimes dig the root up to know it’s gone. I like to minimize the use of herbicides. I then tie up the bag for disposal later. With the cotton gloves still on I put dish soap all over anything I touched while removing the poison ivy. The pruners, shovel, herbicide bottle, etc. I use a paper towel to scrub it, then I hose everything off and let dry. I remove the garden gloves, roll them into a ball inside out, and wash my hands and forearms with the technu. If the ivy touched my long sleeve button up shirt, I take it off and put in a plastic bag with the gloves. When I get home, I wash all my clothes and the cotton gloves I was wearing in warm water with laundry detergent. I then shower making sure to soap up well. It’s a tedious and not too fun job, but well worth the effort to avoid getting poison ivy. Like many other allergies, a person can become more allergic to it the more they come into contact with it. If you got poison ivy, I’m sorry, but it doesn’t seem like there’s a whole lot you can do. If you have it really badly, the doctor’s office can give you medications to take the bite of it off. For at home remedies, there are poison ivy soaps that help dries the oil on your skin. If you know you got it while out in the woods, you can find some Jewelweed near a creek, crush it up, and apply it to the area. Otherwise, we’ve used our All Healing Salve we make under Elkhorn Apothecary which has helped people who had gotten it! It works by drawing out any toxins in your skin. Keep applying it and it will help soothe your skin and work on reducing its severity. 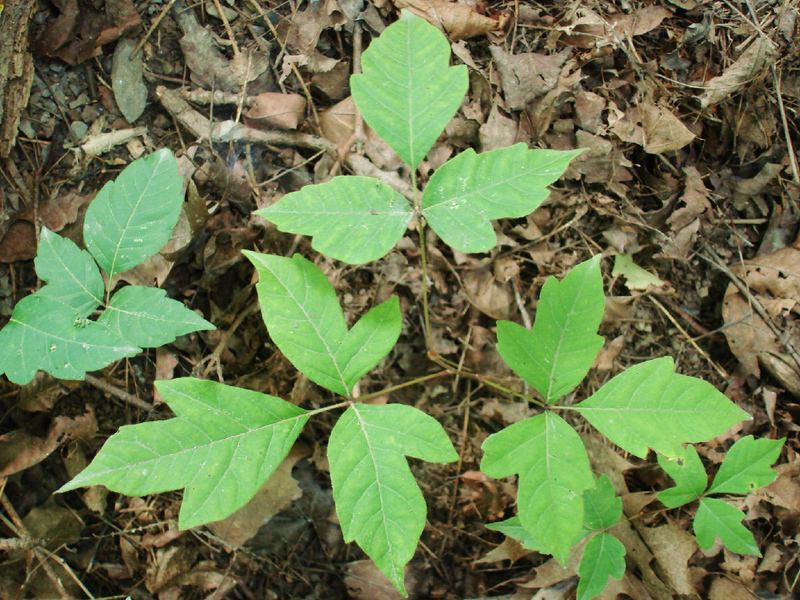 Poison Ivy may not necessarily show up on the skin where it came into contact. The oil travels throughout your bloodstream, meaning it can show up anywhere on your skin and it may even take a couple of days for it to show up. It can also cause swelling and blistering. Your body is basically filtering the toxin out through your skin. It may leaves scars, and can take quite a while for it to heal, even if it’s just a small spot. Just being aware it’s there is the best prevention to getting it on you. It isn’t all bad, it’s berries are excellent food for birds and it’s native. If you get it, there are some natural home remedies that can help you heal through it.